Scott’s Mayfair prides itself on seafood, but it also has a certain reputation as a ‘go-to’ restaurant for the celebs, with sightings of the likes of Madonna, Shakira, Cheryl Cole and Stella McCartney often being reported. And then there’s Nigella. I’ve lost count of the number of times I’ve read about Nigella Lawson and Charles Saatchi having dinner at Scott’s the night before in the tabloids. It’s perhaps for this reason that it is virtually impossible to get a reservation at Scott’s. I know because I’ve tried a number of times. But what I discovered recently was this – it is not difficult to get a reservation at the bar. Having first asked for a table and being told it was full, I decided to try to see if I could book a space at the bar. Success ensued and we rock up at 8pm on a Friday night to discover that low and behold, there was a table free for us. In fact there were a few free tables, not many, but a few. I am not clear whether Scott’s maintains a policy of not taking reservations to keep them free for celebs in case they just turn up, or whether the restaurant does it to maintain an air of exclusivity. Either way, I didn’t find it particularly Kosher. But now you know a way in should you decide to go. I’ve been to Scott’s before, about six years ago, and I absolutely loved that meal. The food was fabulous and the experience proved pretty faultless. My recollections were of a restaurant that epitomised old-school glamour with a gentile top-hatted doorman who welcomed us into the oak paneled dining room. I’ve had an itch to go back ever since to recapture that experience. The doorman remains, and the décor didn’t look to have changed much, but somehow the restaurant felt a little tired compared to how I remembered it from before. The menu offers a decent range of options, including a variety of oysters, caviar, shellfish, and smoked fish as part of the starters. For mains, there’s also a variety of cooked fish and meats for the choosing. We went for the mixed oysters with wild boar sausages. Normally this is priced at £19.50 for six and includes a mixture of the cheaper oysters. We asked for a different selection of oysters, two of each of the West Mersea Natives No 2, Gillardeau specials and Fines de Claire that came in at a higher cost of £24.50 (including the sausage). They were pleasant enough, but their flavour wasn’t punchy enough to justify their price tag. The oysters at Wright Brothers are better and cheaper. 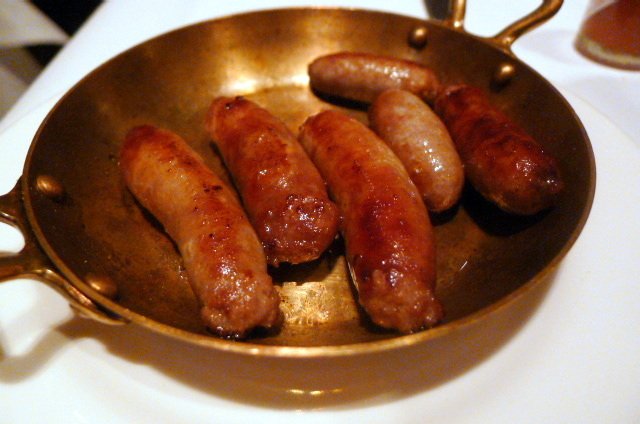 The accompanying wild boar sausages were very tasty though. 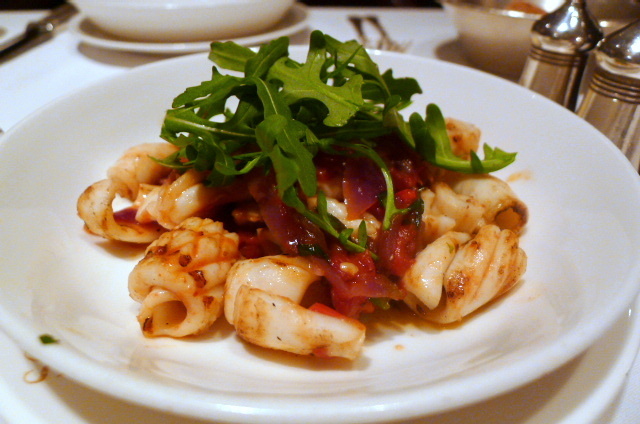 Chargrilled squid (£10.75) was decidedly chewy and a little tough. They were a bit dead on flavour although the sweet and tasty red pepper and chilli relish was nicely done. In fact it was more enjoyable then the squid itself. 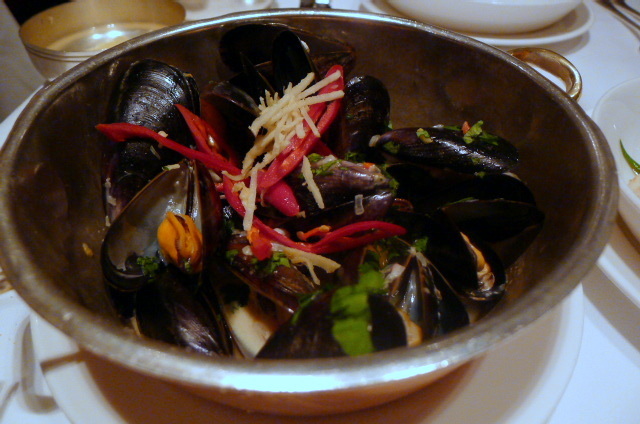 A second starter of steamed mussels with a coconut, ginger and coriander sauce (£9.25) was very pleasant with the mussels being nicely cooked. The sauce was a little salty, but it was creamy with wonderful hints of Asian flavours, especially from the ginger. 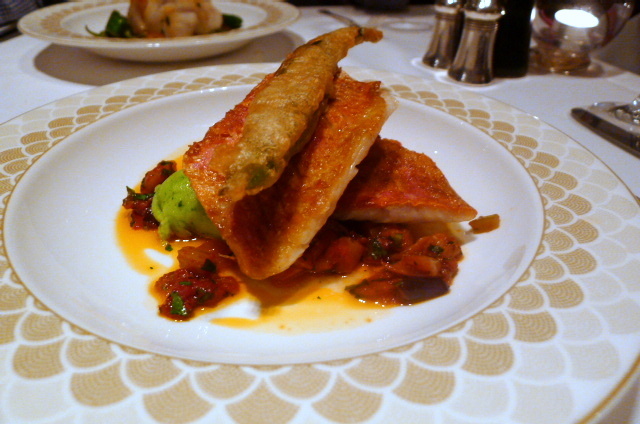 Fillets of red mullet (£24.75) were served with caponata and a wild garlic mash. The caponata exuded a warm Mediterranean feel and the mash was tasty, but unfortunately the freshness of the fish was questionable, with a hint that they were about to go off. For a seafood restaurant, this was disappointing. 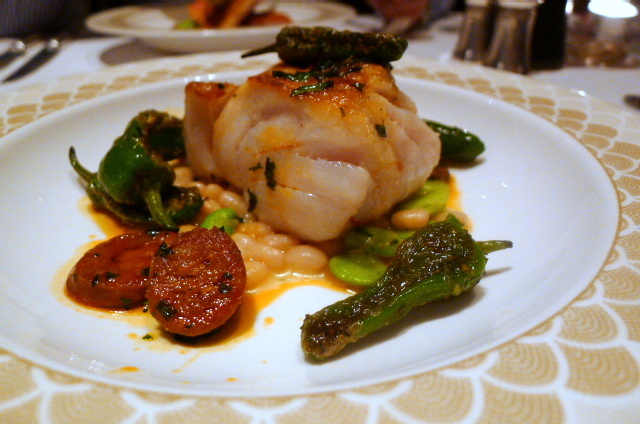 A roasted cod dish with mixed beans, chorizo and padron peppers (£23.50) was better. The cod was moist and the use of beans and chorizo worked well with the fish. However, the peppers were a little bitter and a tad unpleasant in the dish. Sadly, this meal disappointed. Second time round, and Scott’s felt like a shadow of its former self with the experience being a little lacklustre. Some of the dishes underwhelmed, in particularly the questionable mullet and the bland squid dishes. As for the rest, they were decent, but could hardly be called inspirational. 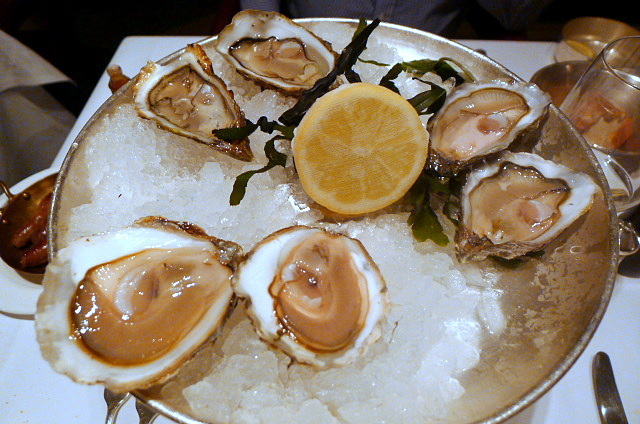 And the oysters – well, they were fine, but their quality hardly justified the cost. The service was decent but far from mind blowing. Perhaps the likes of Nigella Lawson gets extra special treatment when they go to Scott’s because the restaurant reaps immeasurable benefits from the publicity associated with a celeb visit. But I don’t know. For all the hype, the hoops you have to jump through to get a booking, and the prices the restaurant charges, Scott’s hardly seemed worth it. It’s not an entirely bad experience, but it’s hardly special. Note: Scott’s also charges a cheeky £2 cover charge per person. Prices: About £35 to £64 for three courses. Excludes drinks, service and the caviar.